Here is a new and easy way to install your body, wirelessly. If you run LEDs on your rig, this new wireless mount lets you completely detach the body without any messy cables connecting on the body. 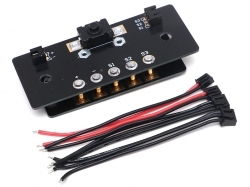 It has three sensored connectors and will work with your light control unit. A switch is also on board the to turn the power on/off manually. One of the inconveniences of RC is the messy wires hanging all over your chassis and body, especially when you run LED lights. 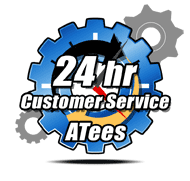 You might find it inconvenient to have to detach the LED light wires from your body when you need to remove it. 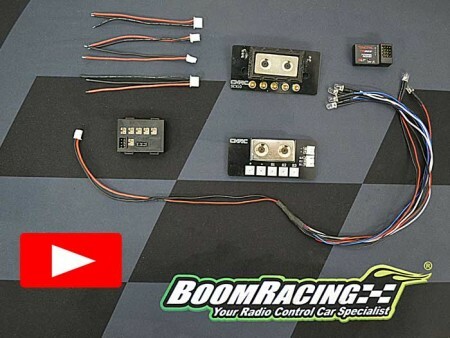 Boom Racing developed a new way to make your life easier with this new mount. This is a stealth wireless mount - when you remove the body, you do not have to disconnect any wires to detach the whole body from the chassis. Thinking forward? You bet. This is a cleaner way to layout your chassis and more convenient especially out at the trails. You can use up to three signal wires to control different functions. For example, it will work with light units with indicators and reverse lights. WHAT CHASSIS DOES IT FIT? This mount fits the Axial SCX10 II directly. It can be used for the Traxxas TRX4 but you must remove or trimming the front inner fenders. To fit other chassis, you can custom fit by drilling two small holes in an open space on the circuit board (do not drill on the circuits) . There are two parts. One side is mounted onto the chassis (Chassis Side Mount), the other side is mounted onto the body (Body Side Mount). The connection wire is included. Both sides come with a magnet to hold your body tightly together. On the Chassis Side Mount, connect the battery side of the receiver to the mount. This is the power source. There are five prongs that are on this mount. The five prongs are spring loaded to connect to the five silver pads of the Body Side Mount. Install the Body Side Mount with the silver pads onto the body. To get the mount onto the body securely, we recommend using a thin EVA material and glue it onto the body. This prevents using screws that will destroy the body. If you don't mind having holes on your body, you can simply use two bolts to mount the Body Side Mount. The wire on the Body Side Mount connects to all of the LED lights installed on the body. Once the power is ready and the prongs and the silver pad connect, your LED lights will light up. There will be no more wires hanging on your body! 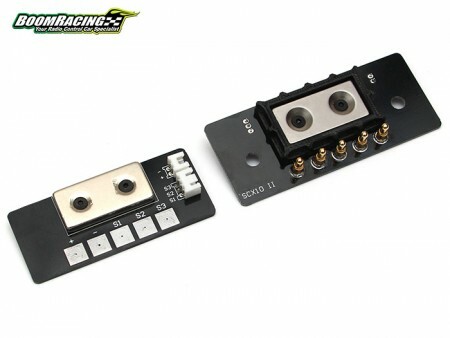 There is a switch on the Chassis Side mount where you can turn on/off the power to the unit. The magnets included are large and strong and will hold your body in place well. The magnet well holds the body in place from side and forward/reverse movement. The Miscellaneous All Stealth Wireless Magnetic LED Body Mount for SCX10 II has an average rating of stars based on 14 customer reviews.